If there is one thing that professional teams in North America do - especially minor professional teams - I find that they like to commemorate anniversaries with uniform changes. I'm not sure why teams insist on doing this, but hockey teams seem to want to celebrate every five seasons with a special uniform. 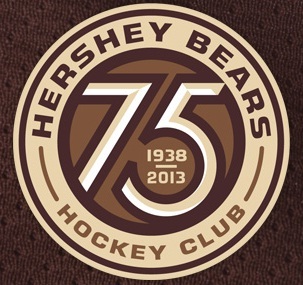 The one team that I've respected for their honoring of traditions and history was the Hershey Bears. But they are celebrating their 75th anniversary this season, and they have followed the same path as a number of minor-league hockey teams before them. We'll start with a short video that Hershey showed before unveiling their changes. Note how they play up the tradition and history angles in this video. So you got a glimpse of the logos at the end of the video. Let's take a closer look at each of these logos and their new uniforms. I'll give you my take on Hershey's new look, and you may actually be surprised! The Bears have simplified their previous logo that featured a much more ferocious bear swiping his right paw down and to the left. I like the fact that the bear logo is simplified, but the circular logo has a definite Boston Bruins feel to it. The logo has a very traditional feel, though, and I believe that this logo could be in play for a long time. It just works nicely, and feels far more professional than the cartoonish logo the Bears were using. A fantastic blog called Sweetest Hockey On Earth has a number of photos of the new uniforms, but let's take a look hem individually. The white uniform looks pretty good. I'm not exactly thrilled with the piping that runs from the shoulder to just over the hip, but nothing is ever perfect, right? The lace-up collar is almost a given for any new uniform that harkens to an earlier period, so I'm not going to beat that dead horse. I do like the striping on the hem and arms, and the logo pops against the white background. If the piping was gone, this jersey would feel traditional but have a modern twist, and would be one of hockey's best. However, even with the piping, I'm still inclined to say that this one is a keeper. The dark uniform suffers from the same piping problem, but the striping on the hems and arms on this uniform is excellent. The logo kind of disappears in the chocolate background, so a couple of changes here could go a long way. I would have loved to have seen a lace that matched the colors of the uniform used for the lace-up collar. That would have really set this uniform off. But overall, it's not a bad looking uniform, and will work for the Bears. The alternate uniform is actually the one I like the most. Gone is the unnecessary piping, and the alternate logo actually works very well on the white background. I'm not a big fan of the font they chose to use, but it is an alternate uniform so a different font is almost a given. The alternate uniform works well, and the Bears have a solid third jersey. Overall, I think Hershey did a decent job in re-designing the team's image. The Bears wore these uniforms for one of their heritage nights, and I think the team could have returned to these uniforms if they were looking for something different to honor their tradition and heritage. However, the new look for Hershey is growing on me, and I think it will work in the long run. What say you, readers: good, bad, or indifferent towards Hershey's new look? If there's a team in the NHL that could potentially make a lot of noise this season, the Oilers could be that team. The Oilers have a plethora of young, dynamic players, and the announcements of both Taylor Hall and Jordan Eberle signing long-term contracts should set the Oilers up for success for many years to come. They have Ryan Nugent-Hopkins a little older and more mature, should get a re-inspired Magnus Paajaavi in camp this season, will see Justin Schultz emerge as a top blueliner, and will see Nail Yakupov try to crack the roster. In short, the cupboard is stocked with good talent, and the Oilers will be able to mature together as a team. While I admit that the injuries suffered by some of the younger Oilers last season are something to keep in mind, I think that the talent the Oilers are assembling will bring them success. I can't say it will result in a Stanley Cup just yet, and I refuse to make comparisons to the Gretzky-led Oilers of the 1980s. But I can say that, like the Penguins a few years back, the youth and talent that the Oilers have acquired should start building towards something great, even if it is still a year or two away. With both Eberle and Hall signing for an annual cap hit of $6 million, neither player has handcuffed the Oilers if they want to re-sign or pursue any young talent. Hall should be around for the next seven years while Eberle signed on for six years, making both players a large part of the future for the Oilers over the next decade. Getting a pair of players like that under contract for a significant period of time is only good news for the Oilers. Hall's recovery from shoulder surgery seems to be going well. He's optimistic for this season already. "It's good, I'm really positive about it," Hall told the media. "I'm not going to say I'm perfect on Day 1 but it feels really good now and I'm excited about the process of being healthy." Eberle, on the other hand, has been training hard this off-season, and believes that he'll be stronger and more prepared for the upcoming season. "Obviously there's a lot of pressure that goes along with this but at the same time I'm going to go out there and do the exact same thing," Eberle told reporters. "I've had a huge summer in training, maybe the best I've had in a long time. "I've been healthy, I don't know whether it's because I'm getting older or if I'm getting my man strength but whatever it is I'm definitely a lot stronger than I've been, for sure, ever in my life and I'm excited for a new season." "Man strength" aside, Eberle looked great at times last season, and getting a healthy Taylor Hall back will help the Oilers in a big way. The wild card may be Justin Schultz, though, as it remains to be seen if he can live up to his billing. After being regarded as "NHL-ready", the defenceman will step into an Oilers camp where a clear leader on the blueline is needed. "I think I am ready for it," Schultz said at an Oilers press conference. "Some people have made it out that I was looking for a guarantee of ice time, but that was never the case. I want to earn my spot and I know I am going to have to do that come the fall. I know I am going to have to work hard this summer and be ready come the camp. "I want to earn everything I get." Isn't that what you want to hear from a blue-chip prospect - that he wants to earn what he receives? That he's willing to work hard to be ready for training camp? These three young men are showing a lot of maturity in their speaking to the media, so there's good reason to believe that they will take that same attitude into the season. If these three men set the stage for the Oilers this season, there could be good things in store for the City of Champions. Edmonton hasn't seen a playoff game in six seasons, and there's good reason to be optimistic this season. While a Stanley Cup may be out of reach of these talented players this season, they'll get many more opportunities with the attitude they are showing this season as long as they keep it up. I don't see success avoiding these men for very long. It appears that Linus Omark's assault on goaltenders will head back to Europe this season as the YouTube sensation signed with EV Zug of Switzerland's National League A. While Omark came over to North America with a ton of hype thanks to a few YouTube clips of some rather spectacular goals, the truth was that he was more suited to an open-ice, free-wheeling game than he was a systematic game that limited his creativity. That's not a criticism of the Oilers, but rather an observance of how Omark played the game. Back-checking wasn't always the first item on his list, and it was clear that he wouldn't be the same player that everyone had seen on YouTube unless the Oilers played every game in the shootout. So Omark heads to Switzerland where the sheet of ice is larger and the defence is played a little looser than what he saw in the AHL and NHL. That's not to say that the competition won't be solid, but Omark should be able to find a little more room to pull off some razzle-dazzle if he so chooses. 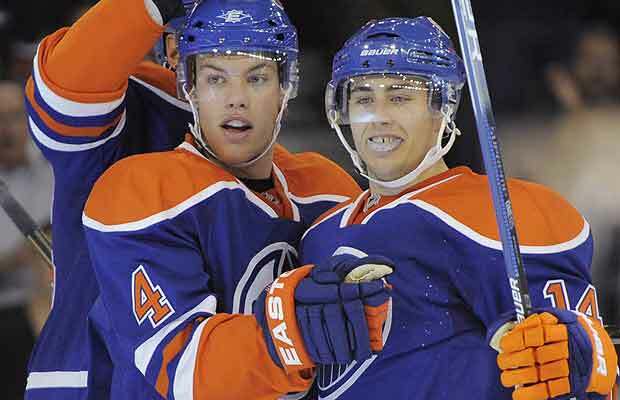 Omark played in just 14 games with the Oilers last season, scoring three goals. In 65 career NHL games, Omark recorded a disappointing eight goals and 22 assists. While younger players take time to develop, Omark is now 25 years-old. He either needs to develop at an advanced rate over the next couple of years, or he's the next Robbie Schremp - lots of amazing talent and potential, but very little hockey maturity. Players such as Jordan Eberle, Taylor Hall, and Ryan Nugent-Hopkins would all be penciled in ahead of Omark on the Oilers' roster this season based on talent alone, and that means a number of veterans may also be slotted ahead of the Swede. 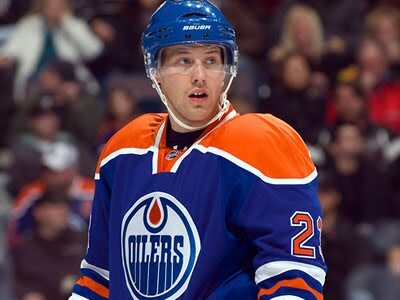 With players like Magnus Paajarvi, Teemu Hartikainen and Nail Yakupov waiting in the wings to crack the Oilers on a full-time basis, Omark's chances as an offensive threat dwindled greatly last season. With his defensive game nowhere near the level that is needed as an NHL forward, Omark's days were certainly numbered as an Oiler. He may have fit in with the Oklahoma City Barons again, but Omark clearly wanted more. In walking away from the Oilers, Omark may still have a chance to crack an NHL roster, but he'll need to show that he regained both confidence and scoring ability in his year with EV Zug. It's a shame that Omark never found his groove in North America. He has an incredible amount of talent, but he never seemed like he was willing to put the work in to get to the next level. Here's hoping that the Swiss air will put him back in the right state of mind. I find it quite sickening in that the NHL and NHLPA cannot agree how to split profits from the game that has already made a vast majority of those involved very, very rich. The players talk about being partners with the owners, but there never once has been a dime paid out by a player for an arena's electrical bill. And the owners cry that they're operating in the red, but the NHL boasts record profits all the time. Honestly, both sides are crying over spilled milk at this point, and it's a little sickening. I know that the owners made their money in other ventures, so it's not like they don't have other avenues they can turn to when looking to make a buck. The players, however, seem to think that going over to Europe and Russia to play hockey is a fine idea. My issue with that theory is that they are taking ice time and, possibly, a roster position from a player who certainly EARNED a spot on that European team's roster. Just because Evgeni Malkin shows up at Magnitogorsk's arena doorstep to play for Metallurg doesn't necessarily mean he should be shown the red carpet. Malkin stated that he has an agreement in principle to play with Metallurg Magnitogorsk on a week-to-week basis if the NHL season doesn't start on time. No owner in his right mind would turn away a perennial NHL All-Star like Malkin, so I'm pretty sure that the mining town of Magnitogorsk will be cheering on Evgeni Malkin if the NHL season is delayed. "'I'm actually against it. And I don't see any prestige in it,' Rotenberg said. Rotenberg, a billionaire businessman with links to Russian President Vladimir Putin, hinted that he could be persuaded to bring in Ovechkin by Safronov and coach Oleg Znarok. 'I don't know. If they persuade me strongly,' he said." It's interesting to note that KHL president Alexander Medvedev has stated that he would enact measures that would allow more foreign-born talent to join KHL teams if the NHL season were to be cancelled. But is that really good for the KHL? After all, if the NHL season begins in January, the KHL teams carrying a number of NHL stars would be crippled a month before the Gagarin Cup Playoffs start. Does it really make sense to disrupt your entire team's chemistry if a player leaves with a month or so to go in the season? Worse yet, what if three players leave? What if your starting goaltender leaves? How do KHL teams fill the void left by an Evgeni Malkin or Nail Yakupov (who is reportedly going to play for HC Neftekhimik of Nizhnekamsk, Russia)? Dynamic players like this cannot be replaced so easily, and their losses could be enough to sink a team in the opening round of the playoffs if they are playing above their potential. So I ask you, readers: if you were running a European club, would you open your doors to an NHL player with the knowledge that you may be left shorthanded once the NHL season begins? Would you rather embark on a season with the club you have established and let the chips fall where they may? Personally, I'd go with the latter. There's no guarantee that the season will be erased and, honestly, the two sides should come to realize that it is smarter to play hockey than it is to cancel another part or whole season. By sticking with my team, I may lose in the short term, but the team will be much better in the long run. While I get that if one team in a league does it, they all have to in order to match their competition, NHL player should have a little more sympathy for their brethren playing overseas. After all, the jobs that they took when they arrived in the NHL were some of the jobs that those in Europe and the KHL used to hold. I guess that if you're a player, the only brethren you care about are those paying the same union fees you are. It's been a busy summer, and HBIC has certainly seen the frequency of contributions to Teebz's Book Club fall off a little. However, the quality of books that TBC is reading should be giving you a lot to look for at your local libraries and bookstores. Today, TBC is proud to present a fascinating book in The Greatest Game, written by Todd Denault and published by McClelland & Stewart Ltd. There have been lists produced, even recently, about events that changed the sport of hockey, but one game in 1975 actually changed the NHL in ways that no one could have predicted. On New Year's Eve, the Montreal Canadiens played host to the Central Red Army team from the Soviet Union, and the game would have a major impact on how hockey was played after that night. Mr. Denault's recounting of that evening's events, the events that caused the game to happen, and the aftermath is all told in The Greatest Game. A member of the Society for International Hockey Research, Todd Denault is a freelance writer who has had his work featured in numerous online and print publications. A graduate of Carleton University and Lakehead University, Todd resides in Cobourg, Ontario today. He also wrote Jacques Plante: The Man Who Changed the Face of Hockey which was reviewed here on HBIC. Mr. Denault does a fantastic job at setting the stage in terms of chronicling the rise of both the Canadiens and the Red Army team. He paints a picture of Canada's hockey dominance in the early World Championships, but shows how the Soviets began changing their training, tactics, and philosophies to become the most dominant amateur team on the planet by the 1960s. At the same time, the Montreal Canadiens were being heralded as the best professional team in hockey history thanks to their repeated and often-consecutive Stanley Cup wins. The 1972 Summit Series was an eye-opening experience for both teams as the Soviet National Team and the Canadian NHL players put on a dazzling show through eight games. But there was worry on Canadian soil as the Soviets nearly escaped the series as the winners, and Canadian hockey ideology was in serious jeopardy. The 1974 Series against the WHA teams didn't do anything but sink Canada lower as the game Canada claimed to have invented looked like it may have been perfected by the Soviet Union. The detail that Mr. Denault put into the first few chapters of The Greatest Game is simply incredible. You honestly get a feeling of what Canada must have been thinking as the Soviet Union routinely captured gold medals at various tournaments over the Canadian squads sent to beat them. Mr. Denault has done a remarkable job in his writing to allow the reader to follow the ups and downs of the Canadian teams that won and lost in the 1950s and 1960s against the Soviet Union. After the Red Army team had dispatched an inferior WHA team, they set their sights on playing the greatest professional team that any league offered in the Montreal Canadiens. The Canadiens had been rebuilding for their own battle against the newly-crowned champions in the Philadelphia Flyers as the Flyers had redefined hockey through intimidation and physicality in the mid-1970s. The Canadiens, once too small to compete with the Flyers, were now better prepared for the battle with the Flyers, but their schedule in 1975 put the Red Army team directly in their path before the Canadiens could try to recapture the Stanley Cup. The Red Army team was well-known to the Canadian fans who were lucky enough to be in the stands or able to watch the game on television. Most of these players were the same players that scared the country in the 1972 Summit Series - Kharlamov, Tretiak, Mikhailov, Petrov - and they were certainly to be feared in 1975 after hammering the New York Rangers by a 7-3 score. The showdown between the NHL's best team in the 1975 campaign and the world's best amateur squad would be a showdown of ideologies, gamesmanship, and skill. The game itself would be bigger than the Stanley Cup Final. This was Canada's team against the Iron Curtain of the Soviet Union. The maple leaf versus the sickle and hammer. The red-and-white squaring off against the big red machine. And because it was New Year's Eve, the fans were dressed to the nines for the game, bringing with them an air of classiness. Even Harold Ballard, owner of the Toronto Maple Leafs, would be in the crowd for the big game. "It's the first time in 54 years that I'll pull for the Canadiens to win," announced Ballard, never lacking for words in the presence of a microphone. Mr. Denault's descriptions of the game and the added insight from the players and coaches involved in the game made for some incredible writing, and he is able to paint a picture in the mind of the reader of exactly what is happening on the ice. Mr. Denault has written an exceptional book that really covers two decades of what some may say was the greatest period in hockey ever, and reading his story kept me glued to the pages. Because of his excellent work in painting the picture of how hockey changed before, during, and after the game, The Greatest Game absolutely deserves the Teebz's Book Club Seal of Approval! 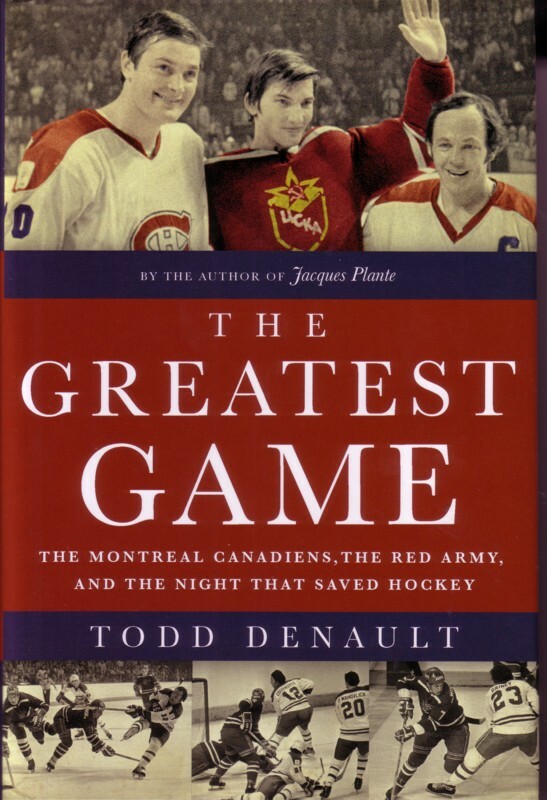 While some may argue that the 1972 Summit Series was the best event to happen in hockey, I'd be willing to make an argument for December 31, 1975 after reading Mr. Denault's book. The score of that game wasn't as important as the result of that game, and that result can still be felt today when two evenly-matched, star-studded teams play hockey for pride and for country over anything else. I picked up The Hockey News' Yearbook once again today, and I have to say that I find myself enjoying the articles once again. If there is one magazine that I pick up every time it is published, this one is it. I have all of them going back to 1995 sitting in my bookcase, and I refer to them a number of times per year when looking for old articles or simply doing research on what number a player wore in a specific year. Honestly, these annual publications are my "go-to" whenever I'm searching for specific details on a player's career. 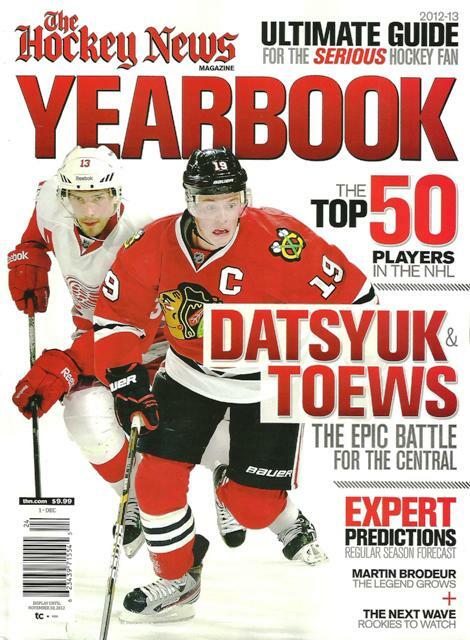 The Hockey News Yearbook is a hockey lover's bible for all important information in previous years. I found myself a little bothered, however, as my copy has Jordan Eberle and Jarome Iginla on it. I realize that they publish multiple copies based on where the magazines are going to be distributed, but I'm quite certain that hockey fans who live in my area would like to see a cover with a Jets player on it. If I had to gripe about one thing, that would be it. Otherwise, I can't really complain about what I found inside the cover. There are some interesting features like Calder Watch and Make It Or Break It!, but the first place I stopped was at the THN fan poll results. THN asked a lot of tough questions of the fans - "How do you feel about the officiating standard in the NHL's regular season?" and "How do you feel about fighting in the NHL?" - but the one question that stood out to me, as a fan, was "Are ticket prices at NHL games too high?" An overwhelming 90% of respondents answered that question with "Yes". For a league that's fighting about how much money is made by either side, how about listening to the people that keep you rich? Nine out of ten people think you're both in the wrong when it comes to the obscene amounts of money you're making, NHL and NHLPA, so why not cut the fans some slack? 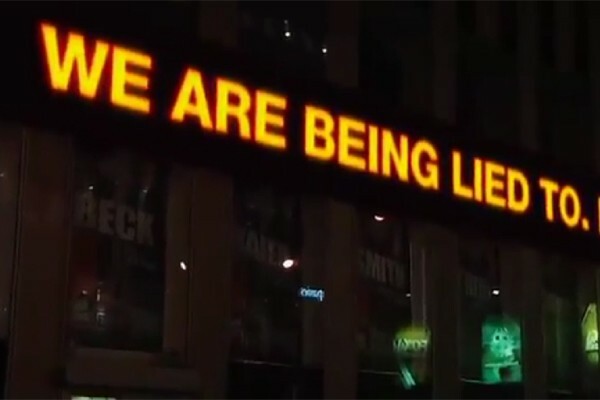 I realize that we all need to earn a living, but the people who make you bazillionaires are sending a clear message: you're killing us with ticket prices. While I'm not privy to having access to the Jets locker room, I did find the article about Zach Bogosian very interesting from a uniform perspective. Bogosian has decided to ditch #4 in favor of #44 this season, so there may be a number of jerseys worn by fans that will need some updating this season. 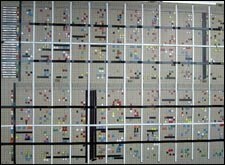 But the rules surrounding number changes were far more fascinating to me. There's a deadline in July that all players must adhere to when wanting to change their numbers. If a player misses the deadline, he must wait a full year until July rolls around again before he can request the number change. The only exceptions, however, are trade and free agent acquisitions or rookies. For example, the Jets signed Olli Jokinen who, previously, wore #13, but the Jets were still in negotiations with Kyle Wellwood, so the Jets' website showed Jokinen with no number for some time. And assigned numbers for rookies in preseason - Mark Scheifele wore #45 during the preseason last year - can be changed if they make the team out of camp with no league repercussions. Scheifele settled on #55 before being sent back to the OHL. I found that article very interesting! There was a good article on Scott Hartnell, a very interesting article on Jamie Benn ("Being at the all-star game made me want to stay far away from Canada"), an article on the emerging American captains in the NHL, an inside look into Max Pacioretty, a quick piece on Martin Brodeur, a Q&A with Steven Stamkos, a one-page article about Joffrey Lupul in Toronto, a piece on Jordan Eberle, and a great look into the relationship between Barry Trotz and David Poile. Honestly, THN does excellent work in putting together these articles. Like every year, though, I want to see the predictions made by the THN staff and editors as to which team will end up on top this season, and where the rest of the teams end up in the shuffle of the NHL season. Honestly, I was surprised at who THN picked to finish first in the Eastern Conference, but, if the stars align right, there's a good chance that Pittsburgh has the horses to push them to the top of the standings. Over in the Western Conference, it appears the THN staff feel that Ken Hitchcock's influence on the St. Louis Blues will continue as they ended up atop the heap in the West. If you're a fan of one of the Canadian teams, I'll tell you right now that THN is forecasting that two of the seven teams from the Great White North make the playoffs. Outside of those two unnamed teams, the other five finish no higher than twelfth-place in either conference. Ouch. I'm not going to reveal who THN picked as the Stanley Cup winner this season, but you'll have to remember that they picked Los Angeles to finish fourth in the Western Conference and New Jersey to finish eleventh in the Eastern Conference. Florida and Ottawa - two playoff teams last season - were picked to finish in fourteenth- and fifteen-place in the Eastern Conference, while the Phoenix Coyotes weren't supposed to be Western Conference finalists at fourteenth in the West. Needless to say, all predictions should be taken with a few grains of salt. Overall, though, another excellent publication from The Hockey News! If you're reading this article, chances are that you've noticed the new addition in black to HBIC. I now have a hockey headlines ticker running on the old blog, and you are able to click any of the news stories. If you do click a story, the story will open in a new page and you can read until your heart's content! While I wanted a CBA ticker to bring the current news on the ongoing negotiations between the NHL and NHLPA, I just couldn't find a news feed that covered just CBA topics. And since I like the look of it and, ultimately, find myself wanting to keep it, it's now a hockey headlines ticker. Today's article is going to be a very short one. I have to get my tail to bed as I'm participating in a softball tournament all weekend, and let's just say that the sunburn I acquired today already has me in sleep mode. We have a chance to win the whole thing tomorrow, so I need some sleep to be in top form. Now that I have the ticker and the favicon sorted out, is there anything else you, as readers, would like to see added to HBIC? Hit me in the comments with your suggestions! I will leave you with this teaser, though: something big is coming in September. Uni Watch is a fantastic blog where everyone shares an obsession for the smallest details on uniforms. I happen to prefer the hockey chatter more than NFL or MLB, but I'm not here to rain on anyone's parade. Paul Lukas, the writer of the ESPN articles and the blog, was given an assignment by his ESPN editors to rank the 122 professional sports franchises' uniforms from the four major North American pro sports. Of course, this is a huge task, but he did it, and there were some surprises. Personally, I was really only interested in the hockey rankings, and that's why I'm writing this article today. I'm not here to rip Paul's rankings apart. Rather, I want to know what you, readers, think of his rankings. I will tell you that I disagree with where some teams finished, but there are some teams that absolutely deserve their rankings. What I will do, though, is post the list from #30 to #1 with Paul's overall ranking out of 122 pro teams in parentheses. After that, we'll discuss. Good? Good. Here's the list. #30(118) - Colorado Avalanche: "Once upon a time, this was a passable-looking team. Not great, but passable. Now, though, it's a jumble of ill-fitting elements -- the apron-string jersey stripes, the pointless side panels, the laughable number font, the alternate jersey that's just a Rangers rip-off. If a team could get a game misconduct for its uniform, the Avs would certainly deserve one." 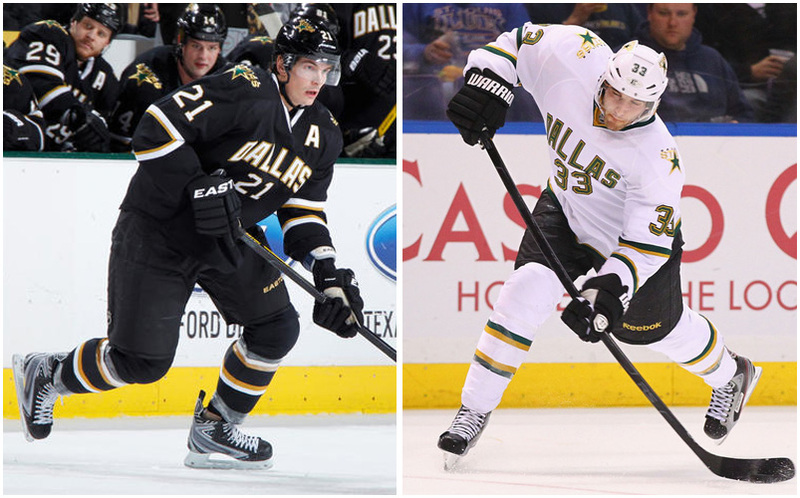 #29(117) - Dallas Stars: "You know how people like to say, 'Less is more?' It's often true -- but not always. Sometimes less is less. Granted, there's something perversely amusing about a flashy city such as Dallas being saddled with such a snoozer of a design, but come on. Did the team's graphics department go on strike or what?" #28(112) - Los Angeles Kings: "The reigning Stanley Cup champs deserve better. The crest is too cartoonish, the stripes down the shoulders and sleeves don't work, and let's not even get started on that alternate uni. The whole set feels like what a minor league affiliate should be wearing." 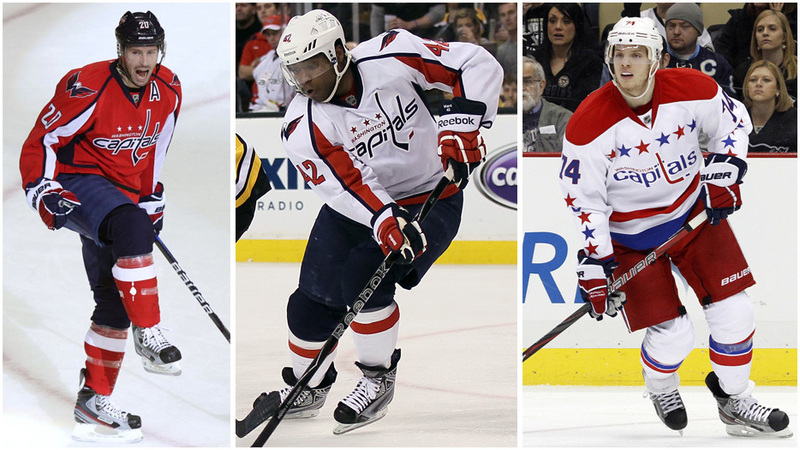 #27(107) - Washington Capitals: "Yeesh, all those apron-string stripes and sleeve panels -- way too busy. And the shoulder logo has always looked like an eagle being impaled on an oil can. The throwback alternate helps, but it's too little, too late." #26(104) - Edmonton Oilers: "Some logos look timeless and age nicely; others feel visually tied to a particular era and end up looking dated. Guess which category the Oilers' primary logo falls into? If there was a TV program called 'That '70s Team,' this would be its logo. Come on, guys -- you've have the exact same logo for 40 years now, and it's clearly outlived its expiration date. Surely you can update it at least a little bit." #25(100) - St. Louis Blues: "The Blues have been ill-served by Reebok's Edge template. The apron strings, swoopy stripes on the pants, the collarbone horns -- it's all too much. And the third jersey feels like a pro forma stab at traditionalism. If they want to look traditional, it's easy: Just strip all the nonsense elements from the home and road designs. A shame, because their primary logo is still among the strongest in the league." #24(99) - Ottawa Senators: "Anyone else out there think the Sens usually look like an AHL team that took a wrong turn on their way to the minor league arena? The main problem is their centurion logo character, who's always felt a bit lacking in gravitas. The black lines are too thick, especially on his face -- give him some details, some feeling, some dignity. The barber pole throwback is a hoot, though." #23(97) - Anaheim Ducks: "There's lots of potential here: The orange and bronze tones work really well together, the giant webbed foot is an icon in the making, and the wordmark (usually a no-no for hockey jerseys) isn't bad. But the diagonal striping on the home and road jerseys feels too gimmicky, and the alternate design is weighed down by the side panels and the phony yoke outline. One day this will probably be a very good-looking team. But not today." #22(94) - Nashville Predators: "The collarbone horns are somewhat defensible, since they sort of mimic the teeth on the crest logo. But the apron strings going down the length of the jersey -- front and back! -- are too much. Clean that up and then we'll talk." 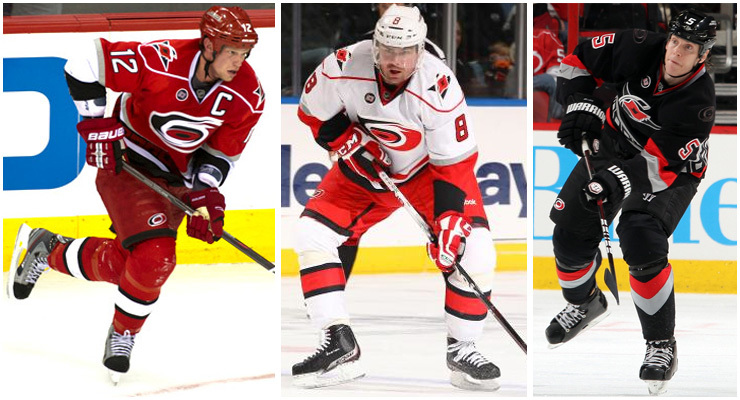 #21(91) - Carolina Hurricanes: "What's the deal with all these NHL teams that now have fake shoulder yokes? If you want a yoke, use a real one, like the Rangers or Devils -- don't just draw an outline to show where it would go. Aside from that, not such a terrible set." #20(81) - Tampa Bay Lightning: "Once you get all the Shazam and Grateful Dead jokes out of the way, it's not such a bad uniform. The wordmark on the road jersey is a mistake, though, and there's no need for those shoulder patches when you already have lightning bolts on the chest and pants. The bigger problem, though, is that awful alternate design. Eliminate that and you'll have the very definition of addition by subtraction." 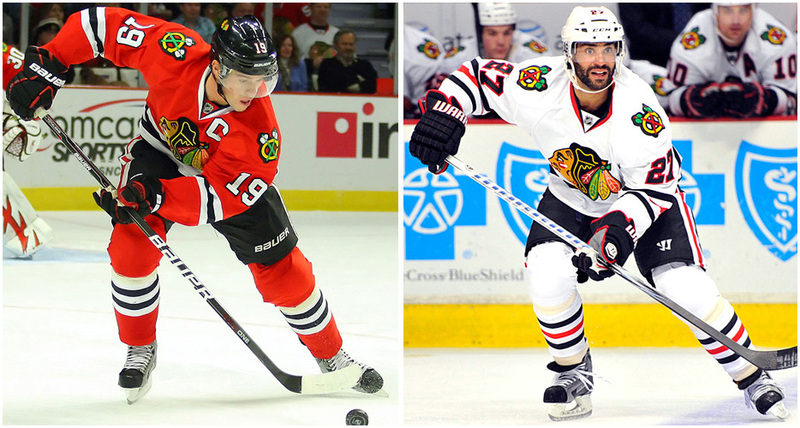 #19(79) - Calgary Flames: "Black has never felt like a good color for this team. You're the Flames, not the charred ashes! Change the black crest to white on the home jersey, and clean up the underarm area and side panels on the home and road designs, and you have a perfectly solid wardrobe. Bonus points for using the franchise's old Atlanta Flames logo for the alternate captaincy designations." #18(76) - Phoenix Coyotes: "Admit it: You miss their Cubist phase. Sure, it was silly, but playing hockey in the desert is a silly enterprise to begin with, so why not run with that? There's nothing wrong with their current look when viewed in a vacuum, but it feels a tad unadventurous, no?" #17(73) - Vancouver Canucks: "Free Willy! The problem here isn't the Orca logo, which has actually developed a little bit of gravitas after 15 years (can you believe it's been that long?). The problem is the city name, which doesn't belong on the jersey and needs to go." #16(72) - Winnipeg Jets: "The Jets are ahead of the curve: While every other NHL team rolls out a blue alternate uniform with a circular crest, the Jets have used that concept for their primary uniform. It's fine, but it's nothing special. 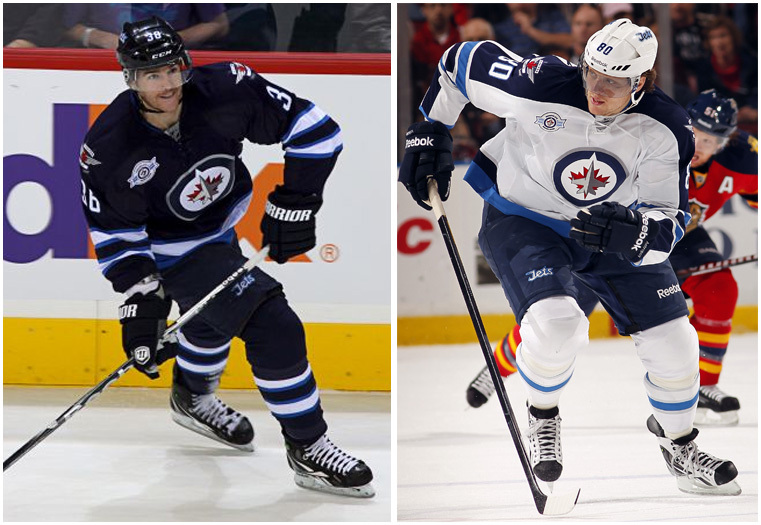 Also, there's only one NHL team that should be wearing a maple leaf on its chest, and Winnipeg isn't it." 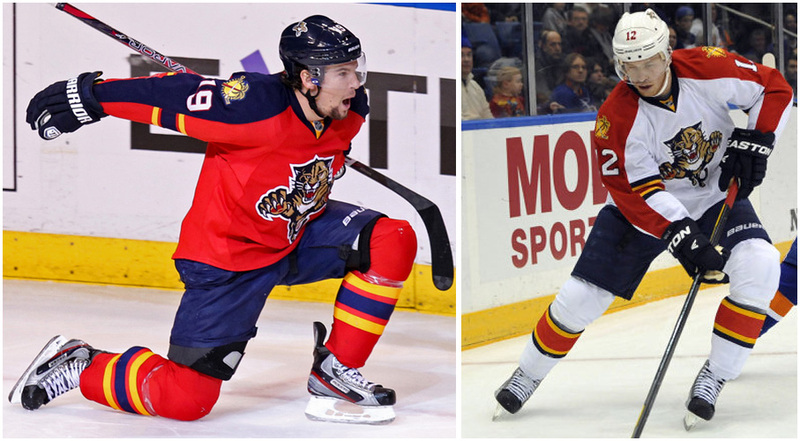 #15(64) - Florida Panthers: "Look, you can have a long panel of color running down the sleeve or you can have stripes wrapping around the sleeves, but you can't have both. Aside from that, this is a pretty good-looking team right now, especially since they've decided to retire the alternate uni, which always felt like a bad fit." #14(60) - San Jose Sharks: "Originally part of the teal invasion of the 1990s, the Sharks have grown into their look quite nicely. The logo is starting to feel like a modern classic, and the orange trim on the home and road uniforms really enhances those designs. Now if they'd just scrap those front uni numbers." #13(55) - New York Islanders: "That logo is starting to feel dated, but they can probably squeeze a few more years out of it. For now, this is a very serviceable home and road set. They'd rank higher if not for the alternate, which might be the single worst uniform in North American sports." #12(54) - Buffalo Sabres: "The old-school crest is a quantum-leap improvement over the Buffaslug, but the torso stripes and front uni number are unnecessary. Docked a few notches for retiring their excellent alternate, which will be sorely missed." #11(49) - Chicago Blackhawks: "There are more colors in Chief Blackhawk's headdress than most teams have in their entire uniform program (all rendered in beautiful jewel-toned chain-stitching, to boot). Against the white background of the road uniform, those colors pop. But the red home uni is so loud that the chest design can't compete with it, like a pop tune that gets drowned out by a heavy metal anthem. 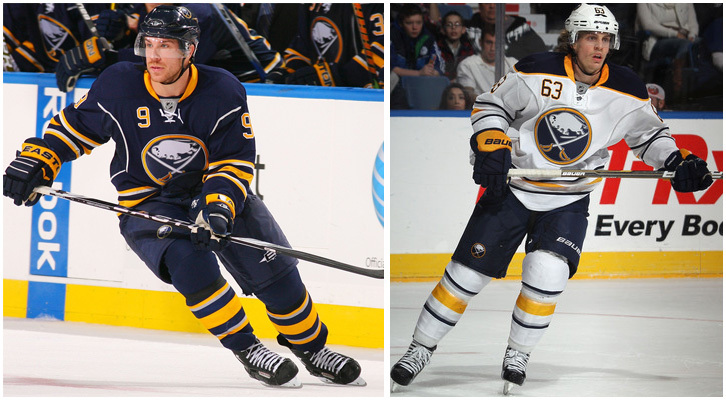 Yet another argument for the NHL going back to wearing white at home." #10(43) - New Jersey Devils: "You don't think of the Devils as a bastion of old-fashioned traditionalism, but consider this: They've never had an alternate uniform. It's like they're the Yankees or something! And really, why bother with an alternate design when your basic look is as solid as this one?" #9(41) - Columbus Blue Jackets: "America's coolest state flag (the only one that isn't a rectangle, don'tcha know) is the basis for the NHL's most interesting jersey crest. The home and road designs are excellent, but that alternate uni feels like retro-by-numbers. Circular logo? Check. Contrasting shoulder yoke? Check. Lace-up collar? Check. Off-white "wheat" tone? Check and mate. Come on, people -- if you're dead set on coming up with a third jersey to sell, try to design one with a little more thought behind it." 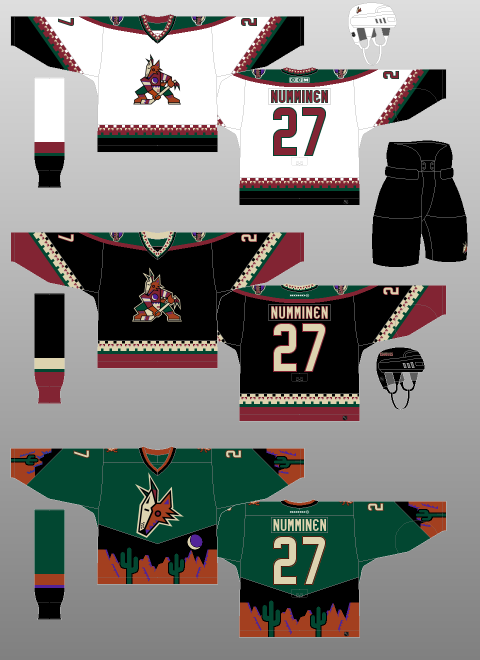 #8(32) - Minnesota Wild: "Almost every design move by this franchise has been a winner, from the primary logo (love the North Star as the bear's eye) to the handsome script on the alternate uni. The circular logo on the home uniform feels a bit forced -- it's a little presumptuous for a team to go old-school when it's existed for only a dozen years -- but it's still a good-looking design. Whoever's running the graphics program here, keep it up." #7(26) - Pittsburgh Penguins: "How can you resist a skating penguin? That's a trick question -- everyone knows there's no way to resist a skating penguin, because a skating penguin is literally irresistible! Once you have that kind of karma going for you, the rest of the uniform falls into place pretty easily." #6(23) - Toronto Maple Leafs: "If you like stripes -- especially striped socks -- then you're gonna like the Leafs. If you don't like stripes, well, the Leafs probably aren't for you. But if you don't like stripes, why are you reading Uni Watch to begin with? Another case of an Original Six team that totally gets it." 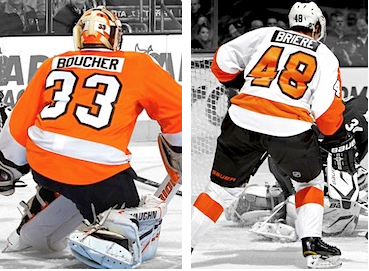 #5(17) - Philadelphia Flyers: "After an ill-advised flirtation with black uniforms, the Flyers have gotten back to basics. Their current look is a sharp update of the design from their 1970s glory days. Some fans don't dig the contrast-colored nameplates, but other observers -- including this one -- really like them." 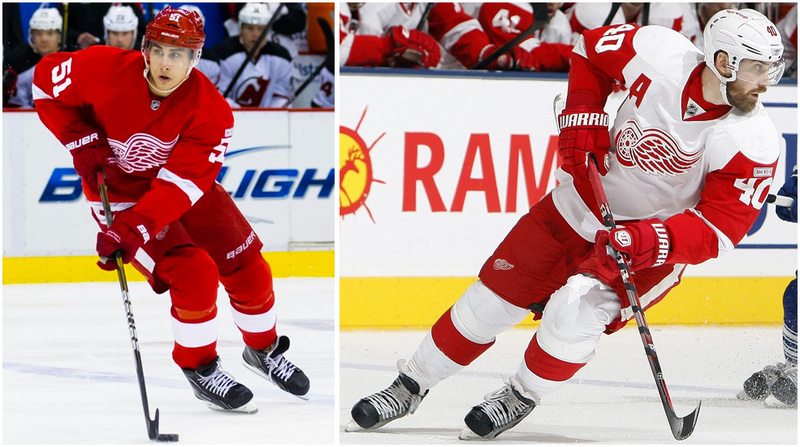 #4(15) - Detroit Red Wings: "Man, those Original Six teams got it right, didn't they? If you want to understand the difference between designing by hand and designing by computer, take a close look at the Wings' logo -- you'd never come up with that on a Mac. Bonus points for the vertically arched lettering on the player names." #3(11) - New York Rangers: "The Rangers present the best argument for why the NHL should go back to having teams wear white at home: Their white design crackles with contrast and crisp highlights (arguably the strongest single uni in the NHL), while the blue set -- well, it's solid, but it doesn't have the razzle-dazzle of the white. Toss in an unnecessary but unobjectionable retro alternate and you have one of the NHL's best-dressed teams. Just wish they'd wear their top outfit at home." #2(5) - Boston Bruins: "A traditionalist's dream, the Bruins' set has everything a hockey wardrobe should have: a strong, bold crest, sharp colors, tasteful stripes and a killer throwback option. First-rate." #1(1) - Montreal Canadiens: "Proud standard-bearers for a league, a sport, a nation and now for the uni-verse as well, the Habs have it all: an iconic logo, two distinct but equally classic uni designs (it's odd that the wraparound chest stripe only appears on the home jersey, but the road design works fine without it), and an ideal balance of red, white and blue. This isn't just a perfect hockey uniform set -- it's a perfect uniform set, period. Unlike the old-school classics in the other sports (Yankees, Celtics, Raiders), it has some major visual pizzazz. Puts the biscuit in the basket, and then some." There you have it, folks. So what say you, readers? 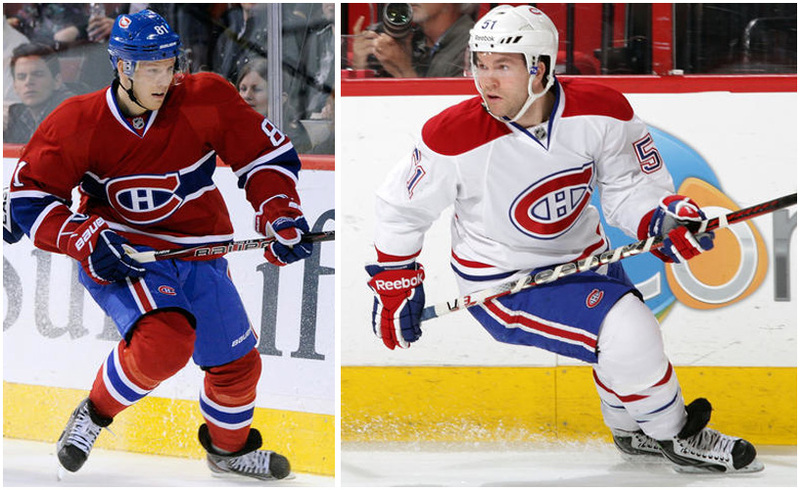 Is Montreal's iconic uniform the best in the NHL? Should Detroit or Chicago be moved up? Is Pittsburgh the NHL's seventh-best uniform set? Have your say in the comments, readers! The image to the left was of a brawl between Vityaz and Avangard in the KHL. Starting this season, there will be hefty penalties served by both players and the teams involved in fracases like this as the KHL has beefed up its officiating by hiring former NHL referee and current ECAC director of officiating Paul Stewart to its ranks as a consultant and as an advisor to KHL president Alexander Medvedev on judicial matters. Following that up, a very poignant memo was sent to KHL teams by KHL Development Vice-President and Disciplinary Committee Chairman Valery Kamensky about the dangerous and reckless play that is plaguing the league. In short, expect harsher penalties for teams like Vityaz who seemingly want to win in the alley rather than the rink. Hiring Paul Stewart is a great move by the KHL. Stewart was a fantastic referee in his time, and has transitioned nicely into managing official for both the men's and women's games in the ECAC. Stewart was a tough son-of-a-gun when he played hockey in several leagues, including the WHA and NHL, before retiring in 1980. He became an NHL official in 1985, working 1010 NHL games and 49 playoff games before retiring. Stewart knows rough and tough play as he routinely found himself in the penalty box as a player. Because of this, rougher players in the NHL always seemed to hold him in higher respect when he was working their games. He is fiercely defensive of officials under his watch, and was even reprimanded and fined for defending his officials when a College Hockey News writer called him out about the ECAC officiating. For an outfit like the KHL, getting a guy who has been through the wars, been in the trenches as an official, and is now helping to guide others through the same battles is something the KHL sorely needs to boost their reputation. Paul Stewart will not take players, coaches, or management trash-talking the officials, and any matter he is consulted on will probably see him wanting to issue some swift and brutal justice. Any occurrence of the violations listed above will come under close scrutiny by the Disciplinary Committee, which will conduct detailed investigations and take the most severe measures stipulated in the regulations. We make no apology for repeating once again that when the League is plagued by injuries, it has a negative effect on the entertainment value of the season and on the image and reputation of the entire League. I wish you all a very good season and an honest, sporting contest!" Honestly, for a league that routinely saw an average of one bench-clearing brawl per season, this kind of crackdown is for the best. Cheap shots, brawls, and general idiocy needs no place in the game, and Paul Stewart can now help the KHL issue some harsh penalties for those players who decide to play like a savage rather than playing like a star. Good for the KHL in bringing Stewart on, and for cracking down on incidents that leave the KHL management a little red-faced. It was announced on Monday that a number of league executives and hockey people were getting together to review and possibly suggest changes to current standards for calls regarding interference, hooking, and holding. While I certainly welcome the idea of enforcing penalties a little tighter again, I'm a little annoyed that all of these hockey minds are looking at bettering the game when the people who are in charge of the game can't agree on how to keep the game going. Hooking and holding matters little when the owners and players can't agree on how to keep the harmony in the CBA negotiations. The NHL's senior vice-president of hockey operations, Colin Campbell, met with a number of hockey people yesterday and today to review how interference, hooking, and holding infractions were being called. Among those in attendance with Campbell include Darcy Regier, Lou Lamoriello, Ray Shero, Steve Yzerman, Mike Gillis, Joel Quenneville, Barry Trotz, Dave Tippett, and Adam Oates as well as players, officials, and other members of the hockey operations department. Clearly, this is a collection of personalities from all facets of the NHL, and all will have some input as to how the league deals with adjusting the standard in making the calls for the infractions. "Personally, I don't think the hooking and holding has slipped," Campbell told the media. "I think we have to find out what we want with interference on the forechecking and interference off the face-off." Anything to help the game stay exciting is definitely good, but this isn't a think tank like they had in 2004-05 when the rules dramatically changed. 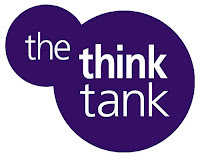 Instead, it appears this think tank will simply ensure the standard is being upheld, and to tweak minor instances where some of the infractions are going unpunished. "There's lots of opinions out there," Campbell stated, "so I'd like to see us sit down and just get that opinion from particularly the three groups that are dealing with it all the time: the referees, the players and the coaches." If this group of people can make the game better, I say go for it. There's nothing worse than seeing a clutch-and-grab game again, especially when the stakes are high in the playoffs and the "little things" go uncalled for the most part. While players, coaches, and managers certainly don't want to see an outbreak of power plays again, there needs to be a more consistent calling of interference. As Campbell said, "Anything that stops a player from scoring" should be reviewed in terms of making the game better. Scoring is exciting. Clutching and grabbing is not. Let's hope these men can make the game a little better over these two days. Maybe It Was Mike Richards? 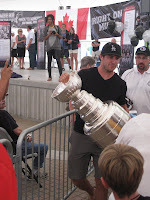 My brother tore off to a little town called Kenora, Ontario yesterday because there was a guest of honor in town: the Stanley Cup! 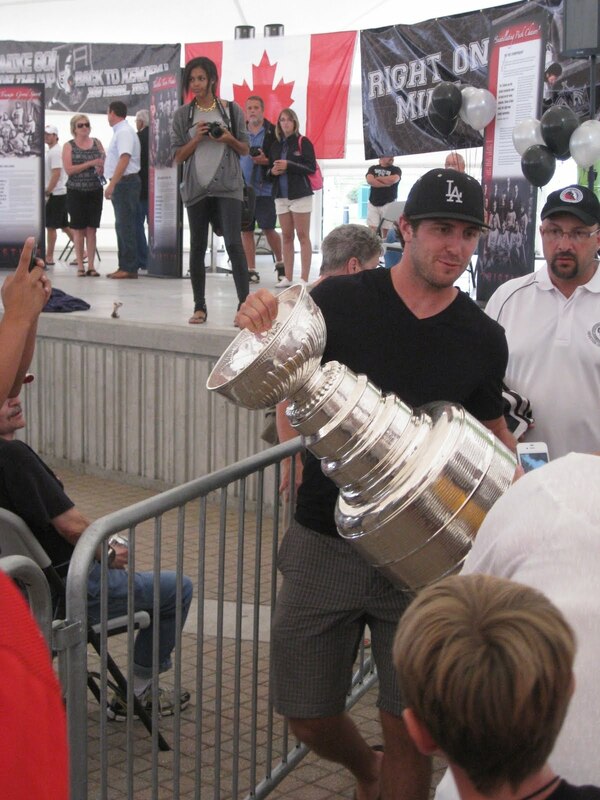 Well, I guess Mike Richards of the Los Angeles Kings was the actual guest of honor, but he brought the Stanley Cup with him as he arrived home! My brother said it was "pretty cool" to meet one of his heroes as Richards came by with the Stanley Cup, but there was a strange report that came out of Kenora on Monday that someone had made off with the Stanley Cup banner commemorating the 1907 Stanley Cup Championship won by the Kenora Thistles! I'll be the first to admit that I thought that maybe my brother did it, but he assures me he has no new wall hangings in his house. Besides, he appreciates hockey history just as much as I do, so I'm pretty certain he wouldn't have taken it even if it was available for the taking. Ontario Provincial Police say the banner, a Canadian flag, and a Los Angeles Kings flag were stolen from the Whitecap Pavilion in Kenora on Monday. The banner is burgundy and white, and is about two metres long and a little under a metre wide. It's not like this was a little piece of fabric! Honestly, if you know who did this, do the right thing, kids. Call the Ontario Provincial Police or Crime Stoppers and report the idiot who stole a piece of Kenora's and hockey's history. If you're reading this and you don't want to turn in the person who committed the theft, please encourage the petty criminal to return the banner to the Whitecap Pavilion. Stealing something like this doesn't make you cool. It makes you an idiot. Do the right thing: return the banner. And don't be a complete idiot. Mike Danton has come a long way from his hitman-for-hire scheme. I'm actually proud to say that his acceptance into Saint Mary's University was probably the best thing that could have happened to him, and I'm happy he got to play CIS hockey with the Huskies. Nothing is more important than being accepted on a team where you're an outsider, and Danton was an outsider with a cargo plane of baggage. So when it was reported that he was considering a move to England to try to further his hockey career, I instinctively became worried as his location and plans for the future were now known to the world, especially the man that derailed his life in David Frost. His visa to play in England was denied today, and I think this might actually be a good thing for Danton despite it setting him back in his hockey aspirations. There's no denying that Danton was a troubled man when he was arrested and sentenced in his conspiracy to commit murder. His time in jail saw former agent David Frost show up on occasion, and it's scary to think that Frost continued to try to impose himself upon Danton's life. It seems, though, that his time at Saint Mary's University saw him get some great support from coaches, teammates, and professors, and the young man was named as an academic all-Canadian because of his straight-A average. While I can imagine some NHL teams are a little leery about signing the former Devils and Blues forward, Danton took the initiative by accepting an opportunity to play in the Elite Ice Hockey League in England with the Coventry Blaze. While the EIHL is not AHL-calibre hockey, it's still a step up from CIS hockey and would give Danton a new challenge where he wouldn't have to face the same scrutiny for his past choices. It was the announcement of Danton's intentions, however, that worried me. After all, Frost was able to manipulate Danton all the way through junior hockey up to the NHL, and there was contact made by Frost wit Danton once he was behind bars. David Frost's reach, it seems, could follow Danton across the ocean if he wanted to contact Danton once more. Whether or not Danton responded would be totally up to him - and I hope he would not - but Frost could legitimately make things difficult for the Blaze and for Danton if he so desired. I feel for Mike Danton in that his hockey dream won't continue in Europe. He reportedly will submit a secondary application, but there's no guarantee that this one will make any difference. The Blaze, however, certainly want to add Mike Danton to their roster, and are working to help Danton jump across the pond. "We believe that Mike Danton will be a huge asset to both the Coventry Blaze and the Elite League as a whole. Mike is desperate to play for the Blaze this season and both he and the club are prepared to wait for the outcome of the secondary application, even if it means that we could be one player down for the opening few weeks of the season. 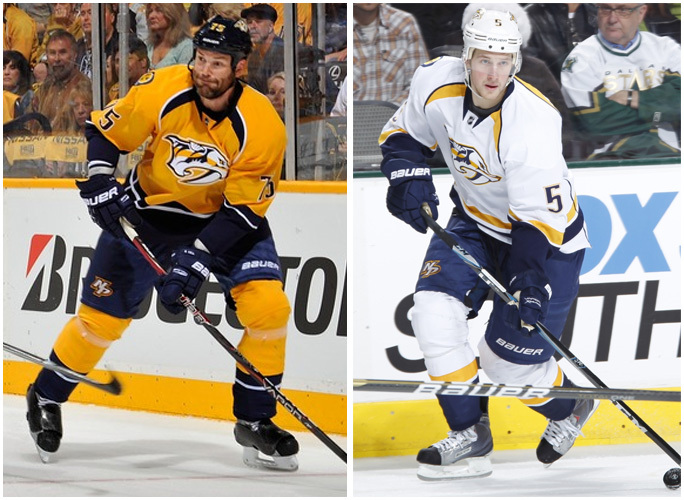 "Mike would be a huge asset both on and off the ice for the club. He is an outstanding example of an individual who has turned his life around in recent years. He maintained a near perfect grade point average at University. He has spoken to several thousand children about making good decisions in their lives and not giving up on second chances. He has won awards for his community involvement. He has started his own family. He wants to and would make a tremendous contribution to Coventry's community programmes (which include a focus on giving people second chances). As someone who has played at the highest level of the sport in the world, he would be a player that junior players could look up to and learn from. 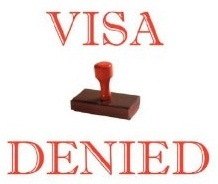 There are so many positive reasons why we believe Mike deserves to be granted his visa." Pretty good endorsement of Danton's character, right? But again, you wonder if one David Frost is just biding his time to try to throw himself into Danton's life once more. I believe Mike Danton is a better man now, and I truly believe he would do everything humanly possible to prevent Frost from ruining his life and the lives of others if he were to reappear. 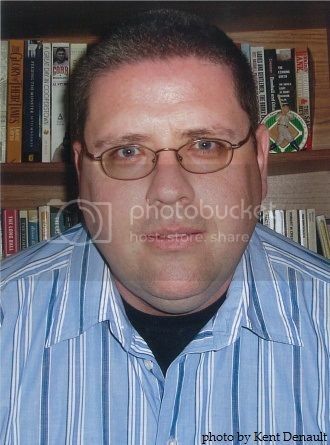 I think, regardless of the outcome of the secondary application, the media should leave Mike Danton alone so that he may continue to live his life as a normal man out of the spotlight. He needs less attention so that he can focus on his life with his family, his life in hockey, and being the upstanding individual that he has turned out to be. Mike Danton is a changed man. He has changed for the better, and has proven that he will not waste his second chance. While he needs a second chance to try to suit up in England, let's leave the story of Mike Danton where it is now so that he can simply live life to the fullest without the attention. He deserves that much after all he's been through. I dont usually talk much about the high-level competitions for the younger junior players, but Canada is really making a mark at the Ivan Hlinka annual tournament. This year's Canadian squad made it five-straight gold medals yesterday in the tournament as they took the championship over Finland in Piestany, Slovakia. And no, there were no punch-ups or bench-clearing brawls for the Canadian team in Piestany in this tournament like there was back in 1987. If you needed any reason to tune in, it was to see Nathan MacKinnon play the game. MacKinnon looks like he could be a great player as he matures, and his performance at the Ivan Hlinka tournament did nothing to sway that opinion. He scored a hat trick in the championship game, and finished the tournament with five goals and six assists in five games. If he's not the consensus first-overall pick in the upcoming NHL Entry Draft, he'll be in the top-five picks for sure. Zachary Fucale recorded the shutout in the 4-0 win over Finland, but his play was solid all tournament. 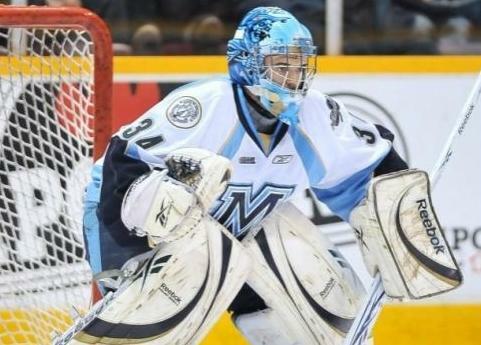 The Halifax Moosehead goaltender appears to be another solid player on the rise in the QMJHL, and he could be a candidate for a World Junior squad in the coming years if he continues to play as well as he did in this tournament. Eric Comrie, the second Canadian goalie, also played well, and he looks like he'll be a quality stopper for the WHL's Tri-City Americans. Comrie was sharp in his games, and played especially well in a "mean-nothing" game against Slovakia late in the tournament in which the Canadians won 3-2. Comrie still needs some time to develop his game a little more, but the young goalie looks strong fundamentally. Captain Sam Reinhart was a force all tournament long, and the WHL's Kootenay Ice will benefit from his exposure in this tournament. Reinhart isn't eligible until the 2014 NHL Entry Draft, but his younger age didn't slow him down in this tournament. Reinhart had a goal and three assists in a 5-2 win over the Czech Republic in the semi-final, and really played well all tournament long. For teams that are building towards the future in the NHL, Sam Reinhart is a player to keep on the radar. The Ivan Hlinka Tournament is always a great glimpse into the future to see which players may become impact players in junior hockey and/or professional hockey. While some players may fall off the radar in the long run, there are usually a handful of players that will be high draft picks in the coming years. That's an encouraging sign for all of the participating players. The NHL schedule was released yesterday, and I'm pretty certain that the CBA battle in the NHL will force a few of us to watch the AHL this season. I loved the AHL when the Manitoba Moose were around, and I actually miss the product that the AHL delivered. Make no mistake in that it's not the NHL, but know that the AHL still provides a pretty good hockey product for your entertainment dollars. And it's a much more affordable choice for those on a budget as well! The 2012-13 AHL season will open on October 12, 2012 and consist of 1140 games for the 30 teams. If you've been paying close attention, you know that last season's Calder Cup champions, the Norfolk Admirals, will not be affiliated with the same team as they were during their championship run. The Tampa Bay Lightning decided on June 14 to move their affiliation to the city of Syracuse, New York as the Crunch will be manned by Tampa Bay's AHL players. 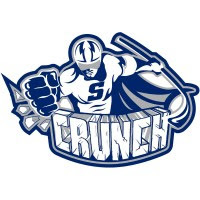 Along with the move to Syracuse, the Crunch changed their logo again to a superhero-based logo as they swap colors to reflect their new NHL affiliate. After five years and a Calder Cup in Norfolk, Virginia, the Lightning decided to move their affiliate to Syracuse. The Anaheim Ducks, who previously held the affiliation with Syracuse, had indicated that they would sever ties with the Crunch, thus allowing Tampa Bay to make the move in affiliating with the Crunch. One month later, the Crunch announced an agreement with Onondaga County and SMG that will allow the Crunch to remain in the War Memorial Arena through 2024. If the Lightning were looking for a more stable affiliate, I'd say they found one. In a rather unsurprising move, the Ducks picked up where the Lightning left as they entered an affiliation agreement with the Norfolk Admirals. The Admirals seem to be the "stopover affiliate" for NHL teams looking to make changes to their AHL system. Chicago and Tampa Bay have both been affiliated with the Admirals since 2000, and the Ducks will be the third team in 12 AHL seasons for the Admirals. While the majority of last season's championship team is gone to Syracuse, former head coach Mike Haviland will remain with the Admirals as an associate coach alongside head coach Trent Yawney. The St. John's IceCaps and Syracuse Crunch will play a three-game exhibition set throughout Newfoundland as the two teams compete for Mary Brown’s Cup. Corner Brook, Stephenville, and Clarenville will play host to the two teams as they battle through the preseason on October 4, 5, and 7. October 12 sees the season open, and the Norfolk Admirals will play as the defending Calder Cup champions and raise the championship banner at home against the Worcester Sharks that night. The defending Western Conference champion Toronto Marlies will play host to the Rochester Americans the very next night as the two finalists from last season open the new campaign. If you're in the Norfolk area and want to cheer on some of the players from last year's championship team, the Syracuse Crunch visit on January 4 and 5, and again on March 29 and 30. While the luster of last season's championship may have worn off by then, the heroes from the postseason run can still use a good cheer or two. December 30 sees the Grand Rapids Griffins and Toronto Marlies meet up in the crisp outdoor air as part of the NHL Winter Classic's festivities as the Hockeytown Winter Festival is taking place in Detroit. 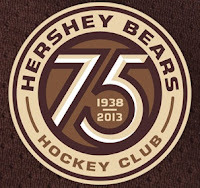 January 20 sees the Hershey Bears take to the outdoors for a game against the Wilkes-Barre/Scranton Penguins as part of the team's 75th AHL season. The Bears-Penguins game will be played at Hersheypark Stadium in Hershey, Pennsylvania. The Bell Centre in Montreal will welcome the Hamilton Bulldogs as they play the Syracuse Crunch on November 9, and again on February 22 as the Bulldogs battle the Rochester Americans. Houston will play at the Xcel Energy Center in St. Paul, Minnesota on November 18 against the Rockford IceHogs. The Norfolk Admirals will be the home team at Washington's Verizon Center as they play the Hershey Bears on December 6. Hamilton and the Toronto Marlies will play on Boxing Day at the Air Canada Center in Toronto. Raleigh, North Carolina's PNC Arena will play host to the Charlotte Checkers and Norfolk Admirals on January 6. The Wells Fargo Arena in Philadelphia will see the Adirondack Phantoms play the Wilkes-Barre/Scranton Penguins on February 22. Lewiston, Maine has a host of games being played at the Androscoggin Bank Colisee as the Portland Pirates move up the highway to Lewiston. October 19 has the Pirates playing the Worcester Sharks. October 27 sees the Binghamton Senators in town. Worcester returns again on November 14. Manchester visits on December 14. Adirondack is the visiting team on December 29. And St. John's makes a trip to Lewiston on February 17. 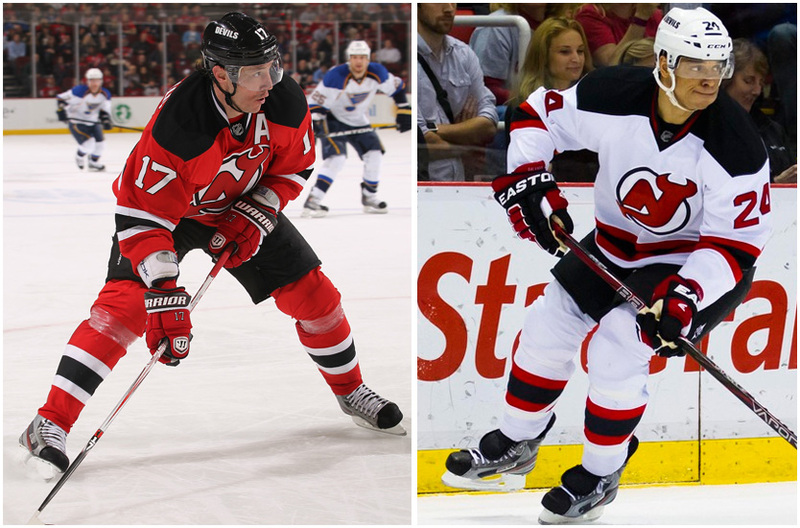 The Albany Devils will call Atlantic City, New Jersey home for a few dates this season. They will play Wilkes-Barre/Scranton in Atlantic City on November 25, Bridgeport on January 13, Adirondack on January 20, and Hershey on February 24. January 27 and 28 sees Providence, Rhode Island host the AHL All-Star Classic as the Providence Bruins play host to the league. March 23, April 19, and April 20 are the three dates where all 30 teams will be on the ice for games. The Bruins have also decided to go more traditional with their logo this season as they changed to a more Bruins-esque look. 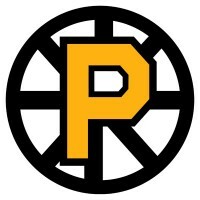 The former spoked "P" that they had used since 1995 will be retired for now as the bolder, cleaner logo takes over as the primary logo of the Providence Bruins. Honestly, I like this logo as it just feels more Boston Bruins than the other logo did, and I think it fits nicely in the affiliation logo scheme. The bear logo will officially serve as the team's secondary logo. There are your highlighted games and changes in the AHL for this upcoming season. Get yourself familiar with the teams and players as the AHL might be the best hockey North America has to offer this season if the NHL and NHLPA continue down the same path towards self-destruction. Today is a quiet day on the hockey front, especially if you're a Vancouver Canucks fan, Winnipeg Jets fan, or just a fan of Rick Rypien in general. One year ago today, Rick Rypien took his life tragically, and the topic is still very present in terms of the battle that he faced every day within himself. Derek Boogaard, Wade Belak, and my own friend, Brad Drake, have all succumbed to a battle within themselves, making the problem with depression a very real one that should be talked about in very honest terms. Tanner Glass, Darcy Hordichuk, Kris Versteeg, and Kevin Bieksa all took part in a charity hockey game this evening in Crowsnest Pass, Rypien's home, to help remember Rypien's battle. For Bieksa, it's a particularly hard day as both men shared a special bond in rising through the Manitoba Moose ranks before rooming together in Vancouver as members of the Canucks. "Not a day goes by that I don't think of Rick, and I am thankful for the opportunity to join his family and friends in an evening celebrating his legacy," Bieksa said in a statement. "Coaching and visiting with these kids gave us a chance to remember what was important to Rick: giving back to kids through the sport of hockey." New hockey equipment was donated to the Crowsnest Pass hockey community through the NHLPA's Goals & Dreams fund, and a memorial plaque and photo album in memory of Rypien were given to members of Rypien's family. Former NHL goaltender Clint Malarchuk is one of the lucky ones who has battled through mental health issues and now leads a normal life. 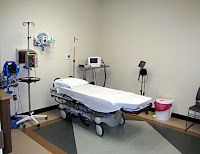 However, his battles included alcoholism and what was thought to be a suicide attempt. Malarchuk understood the battle that Rypien was going through and offered to help, but the young man never accepted the offer. After having his neck sliced open by a skate in 1989, Malarchuk's battle with the onset of obsessive-compulsive disorder kept him awake at night replaying the incident over and over. The thought of the trauma drove Malarchuk into depression as his hockey career would never be the same. "I had been a fan of the kid," the Alberta-born Malarchuk said about Rypien. "He made it on hard work and guts. I’d heard a lot of good things about him. he reminded me a lot of myself." The leave of absence also sounded a lot like Malarchuk. Malarchuk knew that if Rypien wasn't reached out to, that the consequences may be tragic. When Malarchuk's wife read one year ago that a hockey player from Alberta had died, Malarchuk's worst fears had been confirmed. "I said, 'I hope it's not Rick,' but I was right," Malarchuk said. From personal experience, I know that those suffering do not want to speak about the troubles with which they are dealing. Brad Drake, a good friend and valued teammate, fell into the same trap where he was either unwilling or unable to speak about his battles. If you suspect someone is dealing with their own problems, please ask. Embarrassment is temporary, but things could be much, much worse. And if you're reading this and you feel like you're struggling with your own battle, seek out help. 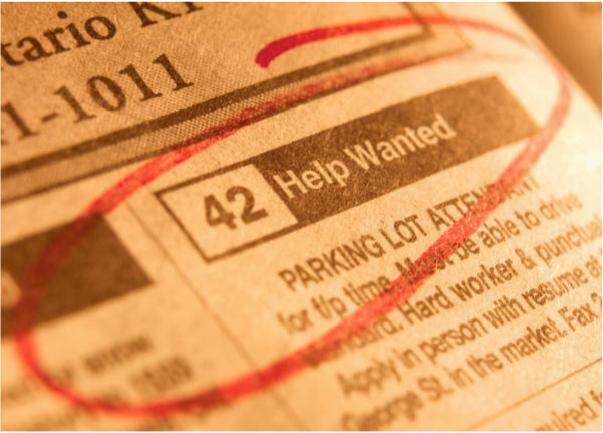 No one has ever been ridiculed or turned away because they ask for help. Admitting you need help isn't weakness; it's a step on the path to being normal. Everyone needs help in this life, so don't be afraid or ashamed to ask for it if you feel your load in this life is being bigger than you can manage. 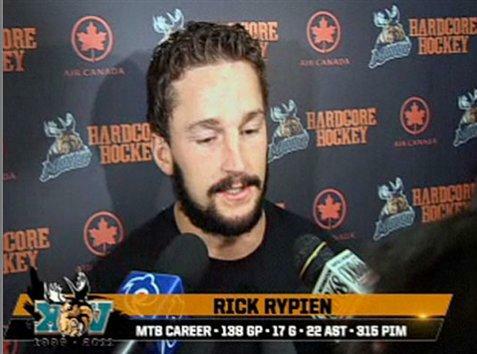 Rest in peace, Rick Rypien. You were a good man. Until next time, raise your sticks high! If there's one thing I enjoy watching, it's hockey. I'm quite certain you know this, but I happen to love a good hockey documentary. To hear a story told from a perspective other than your own gives you a different point-of-view from your own, and that's an excellent way to see things often. I received an email from Jason M. today who wanted to know if I could help get the word out about the documentary he's currently involved with regarding the potential three-peat of the Melbourne Ice, one of Australia's professional ice hockey teams. I had never heard of the Melbourne Ice, but I know they do have hockey programs in Australia and this piqued my interest in the email. Not sure if you can help us out or not and not trying to get any shameless plug or free advertising, but....we have a doco series that we really would love our North American friends to get word of. Its a series about Australian Ice Hockey called 'The Ice – Road to 3 peat' and follows a team, 'The Melbourne Ice' on their journey towards winning a third straight championship in the Australian Ice Hockey league. Inspired by the NHL's 24-7 series its an insight into Australian Hockey which is a third tier amateur sport with guys playing like pros. They don't get paid, they have massive road trips to cover and along the way we get to see it all including why guys from North America come here to play hockey! We're starting to get some good exposure here in Aus but we would really like oversees fans to get a taste – especially with the NHL in off season, its an exciting elixir for hockey faithful. Anyway mate, hope you can help by putting some info on your blog and of course happy to chat if you would like more info. Actually, Jason, I'd be happy to help. After all, the only advertising I do is shameless plugs, so it wouldn't be right for me to say no. But let's take a closer look at the phenomenon that the Melbourne Ice are putting together in aiming for their third-straight championship. The Ice first hit the ice in the Australian Ice Hockey League in 2002, and have become one of Australia's best ice hockey teams. 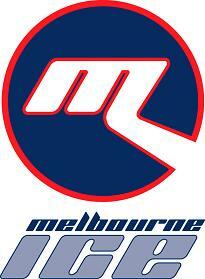 In 2011, they accepted sponsorship from MediBank, and were dubbed the MediBank Melbourne Ice. They also began a women's hockey team that season as the MediBank Melbourne Ice Women take to the ice. Since 2007, the Ice have never finished lower than third overall in the standings, and have routinely advanced to the semi-finals of the AIHL Playoffs. In 2010, the Ice defeated the Adelaide Adrenaline to win their first Goodall Trophy, and then defeated the Newcastle North Stars in 2011 to defend their title. After finishing first overall in 2011, the Ice became the first team to win both the Newman Reid Cup and Goodall Trophy in the same year! And just to wrap everything up nicely last season, the Melbourne Ice Women captured the Joan McKowen Cup as the top team in the women's circuit! Well done, teams! So what's the 24/7 thing that the Melbourne Ice are trying to do? Well, as they play into their 10th season, they are giving fans an uncensored look into life as a member of the Ice by following new players and veteran heroes around as the Ice play through this season with thoughts of a three-peat on their minds. You can watch the videos on the The Ice Road to 3Peat website, but I've posted the videos below with a synopsis! Check them out! This will set the stage for the upcoming videos. Games 1 through 7 will be the basis of this episode with a special focus on the enforcers that make up the Melbourne Ice. The players that have the physical presence on the ice and aren't afraid to let everyone know about it. They are tough, determined and have a specific tactical role within a game and sacrifice their body for it. Episode 2 will instantly show the toughness of the game and prepare viewers for the fast paced action of that will follow in other episodes. We will look to close out this episode with the link to the guys that love the enforcers the most – the scorers. Not bad so far, right? I actually like this look at hockey from the other side of the planet! There have only been three previews posted thus far on Vimeo, but I anxiously await the next previews. This series looks like it could be a keeper! Great job, Jason, and thanks for the heads-up on this story. Honestly, I have to say that I enjoyed the look at Australian ice hockey and the AIHL, and this blogger is behind the Melbourne Ice in their quest for a three-peat! If you've stopped by in the last couple of days, you may have noticed a change to the site. It's not completely obvious, and it certainly isn't eye-catching in terms of flashiness, but I have been fiddling around with some stuff on the site in order to have a better site. Again, it's nothing flashy and certainly isn't going to win me some web award, but HBIC is looking to make things better for you, the reader, as we move forward. And no, I didn't sell out to Walt Disney or hire Mickey Mouse or anything to help me promote the blog. The image to the left is more a less a ruse. But a picture has been added to the site in a permanent spot! If you look up at your address bar or tab where this site is open, you'll see HBIC's new favicon! Yes, it's very simplistic, but I wanted it to be something that harkens back to HBIC. And what better way to harken back than to post the actual letters I use when referring to this website. HBIC is still proud to blog on the Blogger platform, but I wanted a little more personal touch than the Blogger "B". Secondly, I am working on figuring out the coding for a news ticker that I can place just below the HBIC banner. I want a place where people can drop in and get the latest CBA news without having to wade through a ton of stories that have zero to do with the topic. With the reality of another lockout approaching, you're going to get bombarded with a ton of CBA news per day. I am looking to weed out the garbage and only bring you the latest news in one place. Once I figure out the coding to make it scroll properly, I'll post that as well! I actually found a ticker I really like, but the scrolling just isn't working right. If anyone knows how to make the scrolling wrap around so that after Point X, Y, and Z are shown, Point X follows Point Z again. In all my trial-and-errors (more error than trial at this point), I can't seem to get my head around why it won't wrap. If anyone has any answers, email me here. That's all for today, kids. Let's hope that the NHL and NHLPA can start getting their acts together for the sake of this season and future seasons. What Does $8 Million Get You? 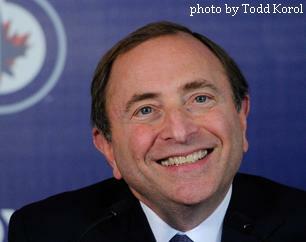 A lot of people would be grinning ear-to-ear after receiving a raise like Gary Bettman received this past year. 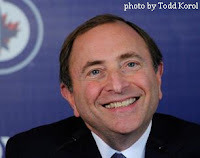 Bettman saw his salary jump nearly $500,000 to just under a cool $8 million for the work he put in this year. Honestly, that's more than I can make in one year working overtime for 24 hours per day, 7 days per week, 365 days per year. But it got me to thinking: if I actually could make $8 million in one year (in some parallel universe, obviously), what the heck could I spend it on? I mean, I already get all the free tickets to NHL games I want, so what eccentric purchases could I make if I really wanted? First off, I'm sure with all the hard work that Gary puts in day in and day out, he probably needs a quiet place to relax and collect his thoughts. My thought? How about buying Lake Winter Island in Wisconsin? How appropriate is the name - Lake Winter Island?!? It will only set Gary back $650,000 USD before closing costs, but it's practically a steal when you factor in the "[b]eautiful brand new (completely furnished) cedar chalet home with wrap-around deck" and "has electricity, phone, water and sewer and comes with its own private mainland access". And I'll bet Bill Daly would love CBA powwows up there where they can fish for "Muskies, Walleye, Bass and assorted Panfish" until the NHLPA comes to their senses. But, honestly, what does the NHL Commissioner spend his cash on? Well, he appears to have a pretty swanky house in Saddle River, New York from what I discovered. Not bad, right? Looks like a pretty nice place, and I assume it came with a fairly respectable price tag. That kind of privacy and seclusion, including the private driveway, would run up a decent-sized price tag, so you know Gary must be doing well. For all that he does, though, does he really deserve an $8 million salary? Since the last lockout, Bettman's salary has gone from $3.7 million - when he literally staked credibility and reputation on the line in shutting down the league for a year - to $8 million when, once again, he is staking credibility and reputation on trying to prevent the owners from spending to oblivion and the players from demanding small countries as part of their contracts. While I'm not one to suggest that one doesn't earn the money one is paid, I'd like to know why my salary hasn't seen a 100% increase in the last seven years. The Board of Governors have to approve the salary increases, but it needs to be asked: what justification was provided for such a climb in dollars over such a short period of time? If you ask me, it sounds like Gary Bettman's salary was tied to league revenues. All we've heard about is how the league continues to set records with the money they are making, and now we see that Bettman is reaping the benefits in a large way. But, as we've seen with the owners, they're willing to throw bags of money at marginal players, so I guess it's nothing new to toss the guy representing the collective efforts of the thirty owners a bag or two. It just seems a little excessive for a guy preaching about controlling spending in a big way. Ok, this is starting to get downright ridiculous. After losing Andrej Meszaros just a few days earlier, it was announced that Flyers defenceman Andreas Lilja had hip surgery last month that will sideline him until late October or November. At the rate that defencemen in Philadelphia are coming up injured, the Flyers might be better off sponsoring a hospital wing or a rehabilitation facility. That makes three significant defencemen out with injury in Chris Pronger, Andrej Meszaros, and Andreas Lilja - exactly one-half of the projected starting six blueliners for the Flyers! While Lilja is older at 37, he played well last season in turning in six assists and a +9 rating. He was reliable and steady, but rarely did you find Lilja's name in the minuses at the end of the night. In short, he was a serviceable veteran defenceman, and it appeared he might be counted on more this season after Meszaros' injury. 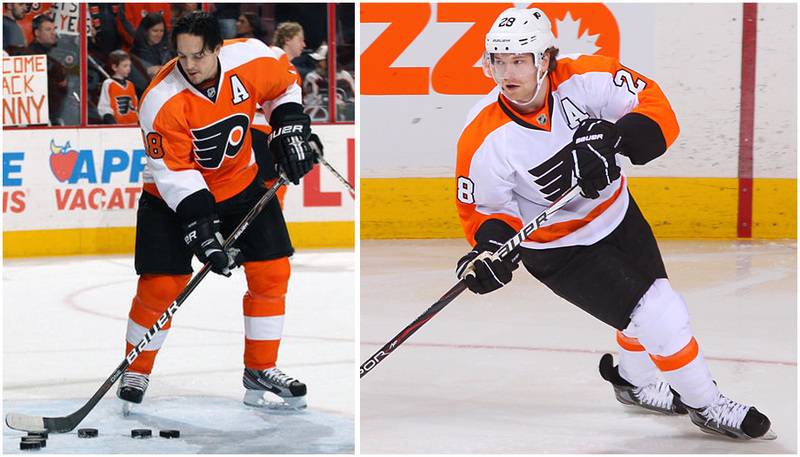 The Flyers will still count on Kimmo Timonen, Luke Schenn, Brayden Coburn, and Nicklas Grossmann to do the heavy lifting this season, and getting Lilja back will take the burden off players such as Marc-Andre Bourdon and Bruno Gervais in the long run. While neither of those two players are bad players in any way, they don't exactly deliver the same quality of play as a Lilja or Meszaros. Of course, if the FLyers are looking to add more offence, Pavel Kubina did play out the season in Philadelphia last season. While Kubina isn't a Norris Trophy candidate by any means, he is another veteran player that can come in and play if necessary. Let's just hope that the Flyers' blueline doesn't take any additional setbacks this off-season. So far, it's been pretty brutal for Flyers fans. Hang in there, Flyers fans. Once you get some of these guys back, your defensive unit is second-to-none. The history of the Toronto St. Michael's Majors in the Ontario Hockey League is actually a long and storied tale. 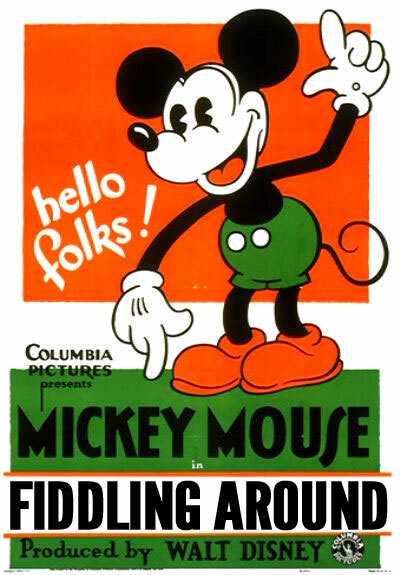 The franchise that you see to the left, however, was revived in 1996 to play again after ceasing operations in 1962. The team was brought back by St. Michael's College School as an expansion club into the OHL, and, in 2006-07, the team was bought by Eugene Melnyk, owner of the Ottawa Senators, and moved to Mississauga. And that brings us to today where new owner, Elliott Kerr, bought the team on May 14, 2012 and wanted to re-brand the franchise. Therefore, the picture above is now nothing more than a footnote as the St. Mike's Majors are no more. 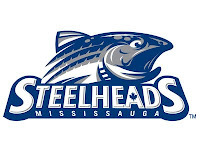 The former Majors are now the Mississauga Steelheads. 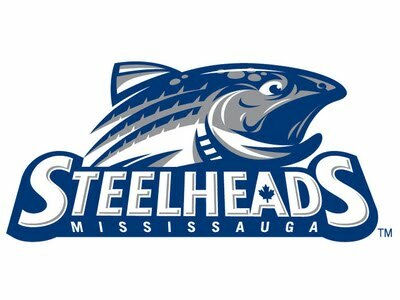 I know we have other fish that play hockey - the San Jose Sharks, for example - but how did the Mississauga team decide on the name "Steelheads"? City of Mississauga Mayor Hazel McCallion said, "The new Steelhead logo is a great representation of Mississauga's heritage, the importance of the Credit River and one of its prized inhabitants, the Steelhead Trout, whose strength, determination and prowess will be brought to life by the skilled and dedicated players as they compete and help create a renewed energy and enthusiasm for the sport of hockey in our community." I'm alright with that reasoning, I suppose. I mean, I can't really rain on anyone's parade for bringing forth heritage, a vital tributary to the city, and one of the main inhabitants of that tributary. I'm just not sold that this was the best name available. I will say this, though: it's already better than "IceDogs". Of course, I was anticipating the release of their new look. Anytime new uniforms are introduced, there is an anticipation that teams will play it smart and keep things simple. Otherwise, there have been some unfathomable designs introduced over the years, and we don't really need to see any of those again, right? However, junior hockey has always been pretty conservative in their uniform approach, and good teams are sensible enough to know that simple is good. "Following an approval process with the National Hockey League (NHL), the team is proud to announce that the Toronto Maple Leafs have approved the use of their iconic Blue and White uniforms for the Steelhead sweater. The team is excited to release their highly anticipated new look to their fans. "'The Leafs have been an iconic brand for close to 85 years and one of the most recognized sport franchises in North America and we are absolutely honoured to be wearing the Blue and White as we head into our inaugural season,' said Steelheads owner Elliott Kerr. Toronto has always been held as one of the better designs in the NHL with their classy stripes and crisp white-and-blue look. If the Steelheads were going to wear what the Leafs wear, that can't be bad, right? There was also some info on a secondary logo in the press release. It reads, "[T]he Steelheads will also introduce a secondary logo which will be the uniform shoulder patch for the upcoming season. The 'M' which will be worn on both home and away jerseys, depicts the Port Credit lighthouse with protruding beams of light and pays homage to one of the City’s most recognizable landmarks." Pretty solid jerseys, right? I like them, and the secondary logo isn't that bad. I have to admit that I like these uniforms, and the logo on the chest is growing on me. 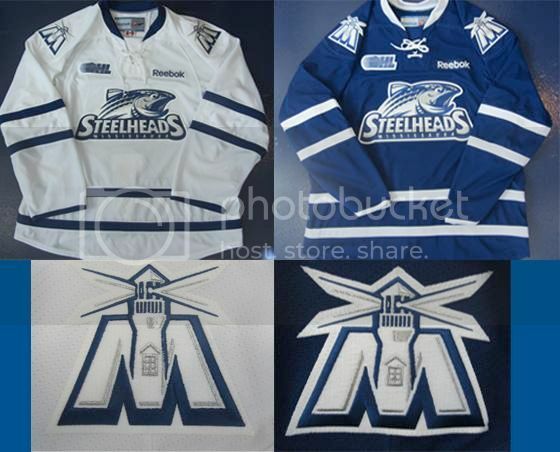 Thumbs-up to the Steelheads for their design! While it remains to be seen how good the former St. Michael's Majors are on the ice this season, they will look like a professional team when they step out on the ice. I think this is one of the better looks in the entire OHL at this point, and they actually don't remind me of the Leafs at all thanks to their logo and shoulder logos. Good job, Steelheads, on creating an excellent uniform! Teebz, Where Are The Pics?